In my conversation with one of the four proprietors of The Backyard in Waco, Chris Cox talked about being polite to moms two or three times, redirected the conversation away from himself + his business not once, but twice, giving props to his teammate/co-owners (they call themselves The Four Horsemen, at least in their group text…it’s a football thing, just go with it) AND even gave some shout outs to what some might call: his competitors. Wait, what?! Exactly. A storyteller at heart, don’t miss Chris’ takes on life, creating one’s dreams, and The Backyard. What’s the focus on right now at The Backyard? “Well, I think I think our concerts speak for themselves. What gave you the idea to start The Backyard? How did it happen? “We had a place across town called Cinema Lounge. And at Cinema Lounge, you dress up a little nicer, we had intimate shows, and on Sunday nights we had a Tejano Night. The Salinas family would come. They liked how we did things. Three of us were pretty familiar with it and our eyes probably lit up more than they should have…because we knew what we wanted to be able to do: to attract bigger artists, bigger Texas Country names, bigger regional names. This place would allow us the space to do that. 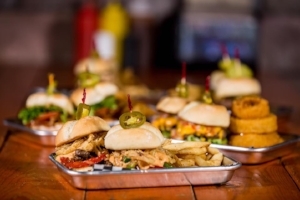 The Salinas family had done a restaurant two or three times, a bar, they’d rent it out for parties, Baylor parties, but it just never took the full concept and got the full potential out of it. When you opened did you think it was a huge success? Are you guys happy with where things are? “We strive to improve every day. There's something that could be changed or upgraded. I don't want to give too many secrets away but we'd love for our video screen to be viewable during the daytime. We’d have a 40-foot screen during the daytime. Whether we ever pull that off or not, don't know but that's something we'd love. What's something most folks probably wouldn't even know that's special about this place? “That's a good question. I'll tell you the one thing that we see: the area is so big that you can have a melting pot of people, ethnicities, income levels and that doesn't always work in a tight spot. Not everybody gets along in a tight spot. “I'll stop right there I'll stop you right there— we’ve done hundreds of hundreds of thousands of dollars of improvement here. And the one, biggest improvement we think we’ve made is when we installed the indoor/outdoor carpet. The grass area. The artificial grass. It seemed, at that moment – the day we announced that – families started showing up. Because the kids had somewhere to run and play. You mentioned growing up around music; tell me more about that? “My stepfather was Roy Robins but his stage name was Robins and the Availables. They were, at that time, the country band in this area. He went to Nashville a buncha times, recorded a bunch of records. You know, just never took that next step. They’d play live every Wednesday on the radio; it was Hot 100 then, I believe. There'd be a line out the door at West Fraternal, which isn't there anymore. It was like my stepdad was a star and in a way, he was. Everybody wanted to talk to him, everybody wanted to shake his hand, or give him their opinion on what song he should learn or they’d have an idea for a song. It wasn't always fun for my mom, but it was always fun for me because I felt like I was running around with a Central Texas Elvis, more or less. And then when I was really young, during intermissions, I would run and slide across the dance floor + chase quarters because they’d put salt on the dance floor so I could slide as fast as I could run – I could slide that far and it was a blast. They’d tell stories of me sleeping on subwoofers. I used to get up on stage, sing a couple of songs, and then they’d pass around the hat for me and collect change. I thought I was a rock star. Only problem was, I couldn't sing for nothing. I was horrible. So I’m gonna lead into my other partners now. I think Brian Brown, who’s the lead singer of Sloppy Joe – I think he started fronting his first band at 17 years old. So he's been in the entertainment business forever. Then, you take my other partner, Russell Clay. He tells us stories of sitting in class at ten years old trying to figure out how to write a movie. We've been dreamers, you know, from day one. We've always wanted to entertain; not so much anymore – but we always wanted to be the center of attention, stars in our own right, and entertainers in our own right. And then you have Chris Braziel, our fourth owner, who doesn't care if anybody knows him at all and is kind of a man in the shadows and…it works for him. But for the rest of us, we like to entertain, we love to bring entertainment, we love to offer our own type of entertainment. That's why Russell and I've been making independent movies now for 12 to 14 years. What kinds of shows and movies have you guys written and created? “We've done horror movies, we've done comedies, we’ve done music shows. We had a show that played on Fox 44 and a few different markets called Cowboy and Lucky. I'm looking at a picture of all four of you; do you guys ever get in fights? Any favorite shows? Who plays at The Backyard? “All four of the owners, we love all types of music, but our Texas Country artists are the ones people show up for religiously. We've had 80s and 90s stars like Eddie Money and Great White – that are huge bands. Ted Nugent's from here; we’ve had him and none of those guys sell out. The Toadies, a 90s alternative band; they’ve sold out. 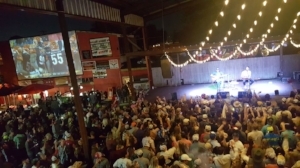 A few others have but most of our sell-outs are Texas Country artists such as Cody Cannon of Whiskey Myers, Wade Bowen, Randy Rogers, and the new kids on the block: Koe Wetzel and Parker McCollum. They’re kind of new on the scene; they sold out on Monday last year. In a couple of days, they're here on a Tuesday and it looks like it’ll sell out. My favorite band that has played here— and it's just because they're just good ole country boys, is Whiskey Myers from around the Tyler area. They've been featured on some TV shows like Yellowstone with Kevin Costner this past year and they've really blown up. “And when it comes to alllll the Texas country artists that are from here, two or three are, and a bunch of band members on all those different shows are from Waco…they’re all so polite. And they're not prima donnas. Wade Bowen is probably one of the bigger Texas artists. Our dads played a lot of golf together and I know his dad, but I don't know Wade that well. He played at The Backyard the day after Thanksgiving and wasn't feeling well, so we pushed the show back for him. Long story short, the next day I got a text: Man, thanks for having us. Sorry I got sick and had to push the show back. What does it mean for you guys when someone buys local vs. going to a chain? “It means the world. It means the world because more money stays in the community. All away from the owner down to the door girl. With corporate, all the money doesn't stay local. That's the one thing. What’s something people who visit The Backyard might not know you’re proud of? “We care. The four of us. On a concert night we can't stop and visit with everybody. But every day there's something that comes across our desk: can you donate to this? And even though we can't throw money at it all, there’s always a pair of tickets to a concert. There's always a gift certificate. Just because we aren't that big philanthropist or can write a big check. Brian plays so many events for free, so many charities for free, so many fundraisers for free. We offer our place for free for fundraisers. I'm talking probably 30 a year we have here. And we'll do them on Sunday afternoons and Brian’ll help ‘em get some bands together. We've even done a suicide awareness with the V.A. across the street, shut down the street. We had a band inside and a band outside. So, caring about the community I think is probably something most people don't know about us. But they also don't know that about other restaurants and other places as well. I know Sammy over at George’s and I know Sammy at La Fiesta and the Gonzalez family and all the different places and there's so much behind the scenes that they do in the community that most people don't get to see. And I wish they could. Because it takes a lot of time and effort to give. It really does. Doin’ their part, they truly are. Want to do yours and get rewarded for it? Hop on the Towny app –not a fan of apps? No problem. Land here instead. You’ll be in a state of app-lessness. There you will find it easy to remember to choose local + keep exploring all the best “local” in Waco! Have a blast!